Thirsty Thursdays are full-on BACK my friends. It’s February and we need cocktails, right? Well, I will speak for myself. I need cocktails. I couldn’t be more please that it is most of the way through the week, although if you saw me today I would surely be up to my chin in recipe development, which also means I would be up to my chin in dirty dishes. But there is nothing to make doing dishes more fun than a margarita. Unless it’s two margaritas. For the Simple Syrup bring the water and sugar to a simmer for 2-3 minutes until the sugar has dissolved. Pour into a bowl and set aside to cool. Preheat the oven to 400 degrees. Place the grapefruit halves on a sheet pan and sprinkle the sugar over the tops of the sliced grapefruits and roast the grapefruits for 15 minutes until the tops have caramelized. Let the grapefruits cool to warm. Juice the grapefruits into a small pitcher. 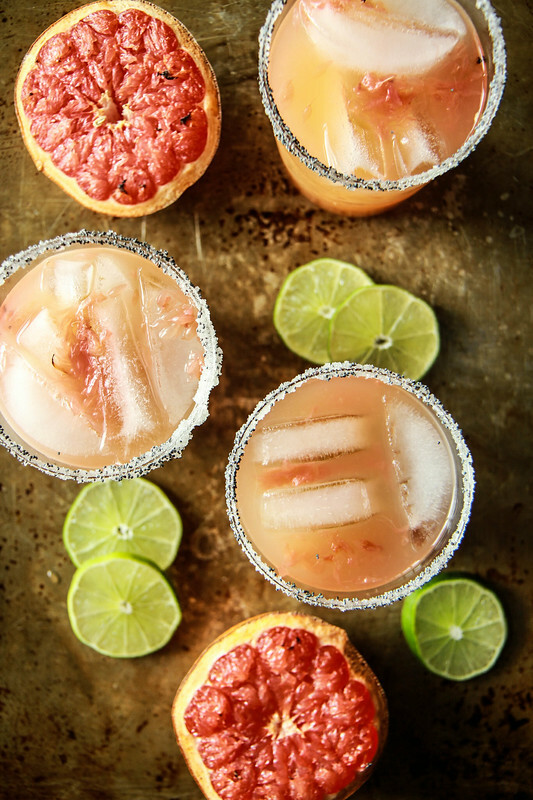 In a cocktail shaker filled with ice, combine ½ cup tequila, ¼ cup grand marnier, ¼ cup fresh lime juice, the simple syrup and the grapefruit juice. Let chill in the shaker while you prepare the 4 glasses. 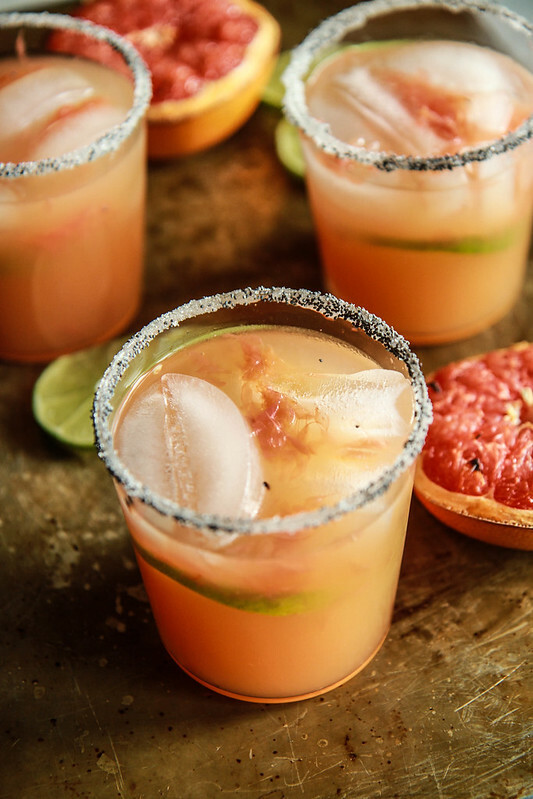 Swipe the glasses rim with a lime wedge and then dip the rim in smoked salt (or regular kosher salt or sugar). Fill the glasses with ice cubes. Shake the cocktail shaker vigorously and then strain into the 4 prepared glasses. Oh, two margaritas for sure seems right! Roasty, toasty, smoky, bitter, sweet and tart is the BEST description! I so need one of these right now. It’s been a long week! Love the idea of roasting the grapefruit to bring out the flavor. gorgeous margs!!! 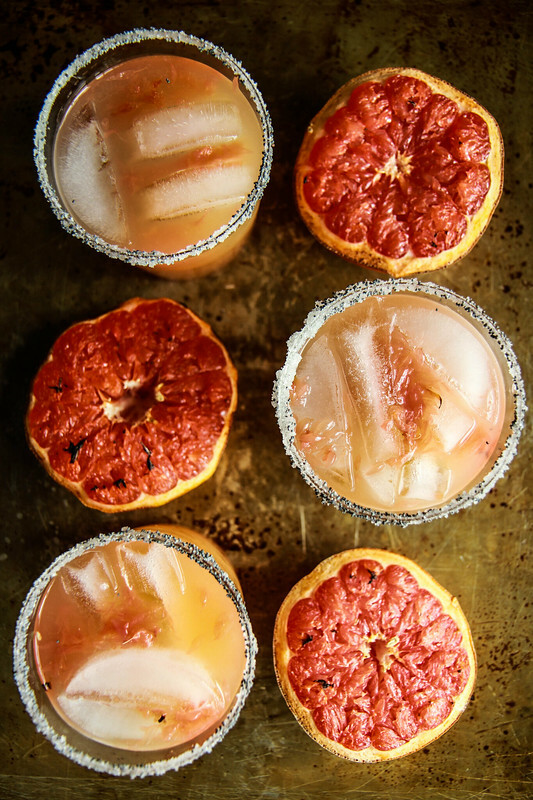 I’m so into the grapefruit/blood orange cocktails right now, and I love that salty rim. yum! My tastebuds are positively tingling right now, Heather! !